Make a small hole in the base of the drinks cup and thread through the string, leaving a few inches either side of the cup. 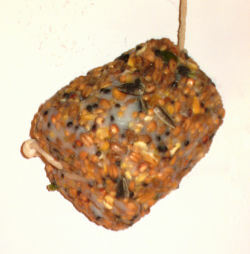 Melt the fat gently and mix with the birdseed (this should be done by an adult or with close adult supervision). Leave to cool slightly, then pack it into the cup, making sure the string comes out of the middle of the cup. Leave to cool. Remove the cup and tie the string around the cake to secure. Tie the cake in your garden for the birds to enjoy.